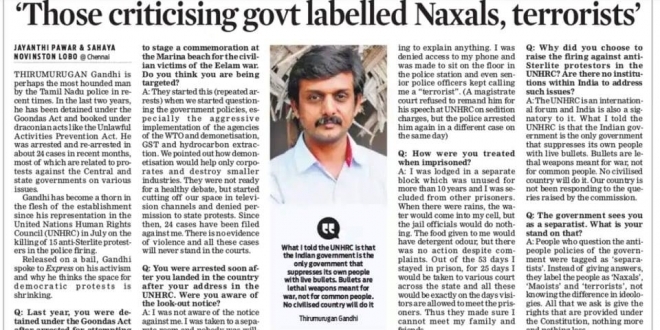 Thirumurugan Gandhi is perhaps the most hounded man by the Tamil Nadu police in recent times. In the last two years, he has been detained under the Goondas Act and booked under draconian acts like the Unlawful Activities Prevention Act. He was arrested and re-arrested in about 24 cases in recent months, most of which are related to protests against the Central and state governments on various issues. Gandhi has become a thorn in the flesh of the establishment since his representation in the United Nations Human Rights Council (UNHRC) in July on the killing of 15 anti-Sterlite protesters in the police firing. Released on a bail, Gandhi spoke to Express on his activism and why he thinks the space for democratic protests is shrinking. Last year, you were detained under the Goondas Act after arrested for attempting to stage a commemoration at the Marina beach for the civilian victims of the Eelam war. Do you think you are being targeted? A: They started this (repeated arrests) when we started questioning the government policies, especially the aggressive implementation of the agencies of the WTO and demonetisation, GST and hydrocarbon extraction. We pointed out how demonetisation would help only corporates and destroy smaller industries. They were not ready for a healthy debate, but started cutting off our space in television channels and denied permission to state protests. Since then, 24 cases have been filed against me. There is no evidence of violence and all these cases will never stand in the courts. You were arrested soon after you landed in the country after your address in the UNHRC. Were you aware of the look-out notice? How were you treated when imprisoned? A: I was lodged in a separate block which was unused for more than 10 years and I was secluded from other prisoners. When there were rains, the water would come into my cell, but the jail officials would do nothing. The food given to me would have a detergent odour, but there was no action despite complaints. Out of the 53 days I stayed in prison, for 25 days I would be taken to various court across the state and all these would be exactly on the days’ visitors are allowed to meet the prisoners. Thus they made sure I cannot meet my family and friends. Why did you choose to raise the firing against anti-Sterlite protestors in the UNHRC? Are there no institutions within India to address such issues? A: The UNHRC is an international forum and India is also a signatory to it. What I told the UNHRC is that the Indian government is the only government that suppresses its own people with live bullets. Bullets are lethal weapons meant for war, not for common people. No civilised country will do it. Our country is not been responding to the queries raised by the commission. The government sees you as a separatist. What is your stand on that? A: People who question the anti-people policies of the government were tagged as ‘separatists’. 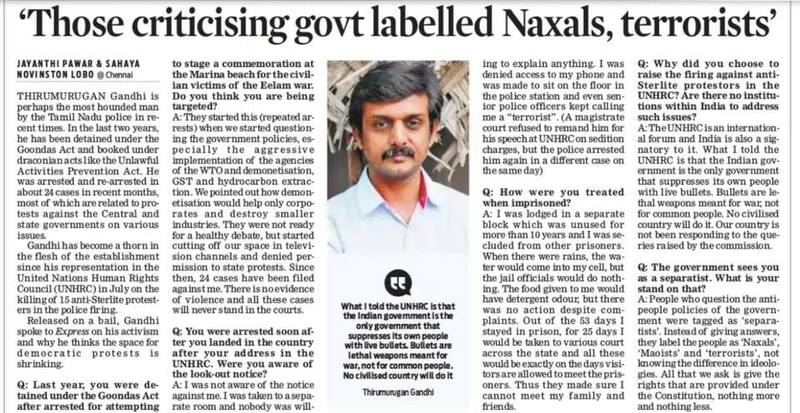 Instead of giving answers, they label the people as ‘Naxals’, ‘Maoists’ and ‘terrorists’, not knowing the difference in ideologies. All that we ask is give the rights that are provided under the Constitution, nothing more and nothing less.